A view from the bustling center of our galactic metropolis. Spitzer Space Telescope offers us a fresh, infrared view of the frenzied scene at the center of our Milky Way, revealing what lies behind the dust. This stunning space wallpaper reveals a view from the bustling center of our galactic metropolis. 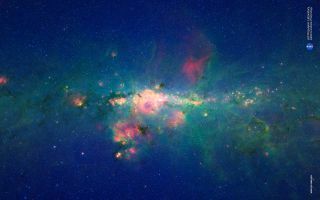 Spitzer Space Telescope offers us a fresh, infrared view of the frenzied scene at the center of our Milky Way, revealing what lies behind the dust.